I took the developer survey from a link on https://dba.stackexchange.com. "You are eligible for the Census badge. Please log into your Database Administrators Stack Exchange account or create an account to earn your badge." 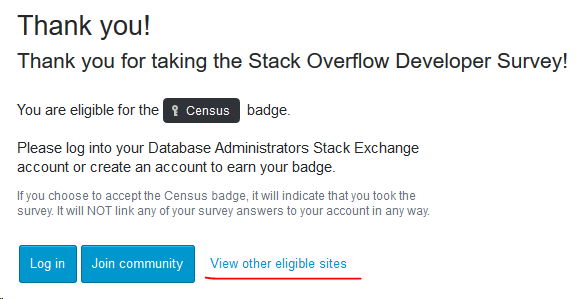 But I would love to have the census badge on my Stack Overflow account. Is this possible? There is a "View other eligible sites" button. Using it I was able to transfer the badge to my SO account. Yeah!! You can get the badge on any of the following sites: Ask Ubuntu, Code Review, Cross Validated, Information security, Server fault, Stack Overflow, Super User. You cannot transfer the Census badge after accepting it. Right before you accept it, make a choice. Not the answer you're looking for? Browse other questions tagged support badges developer-story . Can I log into other Stack Exchange sites using my Stack Overflow ID? Is the inbox link URL correct?